Storytime Standouts’ guest contributor takes another look at Harry Potter and the magic delivered in J.K. Rowling’s wonderful series. I am reading Harry Potter and the Philosopher’s Stone to my oldest daughter this summer. I have read the series once after a friend, who has read it, literally, dozens of times, insisted that I could not put it off any longer; I had to read it. So I did. And I absolutely loved it. I’m not sure why I didn’t read it when it originally came out. I remember listening to how much everyone loved it and the movies are among my favourites. Waiting did have one advantage, however; by the time I read the books, they were all published so I could read them all back to back. Now, as I reread Harry Potter with my daughter, I’m remembering all of the things I loved about the books. I am completely absorbed in the story once again and so is she. Lately, all of her playing is geared around wizards and wizardry. All of their dolls are currently attending Hogwarts. As I’ve watched her get wrapped up in the story of Harry and his friends, I realized that only one of my students was reading Harry Potter this year. This could be because the kids have read it when they were younger, but it seems unlikely that they have read all seven books by grade four or five. I am hoping that with series such as Twilight, The Hunger Games, Warriors, and Diary of a Wimpy Kid, Harry Potter is not being forgotten in this age group. I think grade four is a great age for the first book. I think I will have to poll my class in September to see how many have read the series or at least some of them. Harry Potter came out 12 years ago. The Deathly Hallows came out in 2007. It’s entirely possible that with the hype of so many new books over the years, that Harry is not the most sought after character at the library. It would be a shame to forget how magical and amazing JK Rowling’s books are. Unlike the Twilight series or The Hunger Games, children get to grow and mature with Harry. As he becomes older, the conflicts and challenges he faces become more involved and difficult. The intensity builds with each book. Not that the intensity doesn’t increase with each of the books in the other series, but the intensity is there from the beginning. Katniss* is fighting for her life from chapter one. Bella and Edward** are drawn to each other immediately. In Harry Potter, we meet a young boy poorly treated by relatives that do not want him. 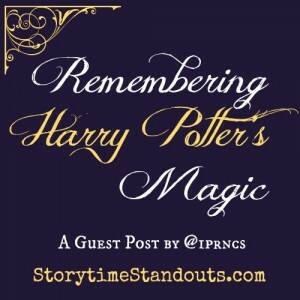 The first story captures our hearts and interest by letting us connect to him and feel the same amazement that he does as he learns about his wizarding background and accepts his future at Hogwarts. Harry has an innocence that Bella and Katniss do not. Of course, they are entirely different books, but I know that they were the central focus of my grade five classroom not that many years ago. Now, based on what I’ve seen my students borrowing from the library, that focus has shifted. I don’t actually read Harry Potter in the classroom. But this year, I think I will make an effort to see how many kids have read it on their own or with their families. It will be interesting to see how many of this year’s class, who would have been born in between Goblet of Fire and Order of the Pheonix, are familiar with the novels. Since they became readers, the “Harry Potter Hype” has lessened, as all hype does. Regardless of which books are grabbing the most attention today, we need to remember that there are some books (many) that should always be on a person’s “Must Read” or “Have Read” list. The Harry Potter series should definitely on those lists. You are so right about this. Harry Potter created magic more than once in our household. As one might expect, I was the first to read Harry Potter and the Philsopher’s Stone. When our sons were aged about five and seven, my husband and I read the book to them. The entire family treasured the experience and it really drew my husband into reading aloud to the boys. Years later, when my youngest boy was about ten, my husband suggested that they should reread Harry Potter (just the two of them). My son was not satisfied with the pace of my husband’s nightly reading and very quickly decided to read it himself. Just a few months later, my son had finished reading the seventh book. He and we viewed it as a major accomplishment. Basically, he discovered the love of books and lost any sense of intimidation based on the number of pages or thickness of a book. This series launched him into reading for pleasure.